Capital Captions provide professional closed captioning and subtitling services for e-learning and online courses. 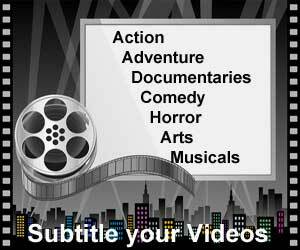 We offer closed captioning and subtitling at competitive prices, with fast turnarounds. We take a tailor made approach to captioning and aim to caption videos with a writing style and text format that is in-keeping with the video content. Adding subtitles to educational videos can vastly improve the accessibility and effectiveness of online learning material, so choosing the right subtitling company to take on your project is crucial. Information is better retained by the human brain when it is received via multiple streams: e.g., when a video uses audio and visual effects as well as subtitles. Including closed captioning with your e-learning videos allows search engines to index the text included in your videos, which is great for your SEO and Google ranking. Finally, subtitle and caption file transcripts can be included as downloadable documents which can be used as extra revision and reference material for students. SRT: Basic format suitable for web use (including YouTube, Vimeo, Facebook and many websites). Because of the basic coding of SRT files, changes in formatting, styling and placement can only be made by burning the subtitles using professional video editing software. WebVTT: Effectively an evolution of SRT. WebVTT features a lot of the same simplicity as SRT, but enables formatting, styling and positional changes in its coding. It is also compatible with HTML5 websites. EBU-STL: Most well known UK and US broadcast format. Features full functionality in terms of positioning, formatting, styling, etc. Requires broadcast software in order to display correctly and is unsuitable for web use. XXML / DFXP / EBU-TT: The new age advancement to EBU-STL, broadcasters are slowly moving over to using this format (which is given any of these three names). Full functionality of EBU-STL is present in this style, but the subtitle / closed caption file can still be viewed within a normal text editor on a PC or Mac. Also, these formats are compatible for both broadcast and online which is invaluable to many videomakers. SMI / SAMI: The subtitling format used with Windows Media Player. At Capital Captions, we only hire the most highly experienced and qualified transcriptionists and subtitlers. However, in addition to being skilled writers, typists and formatters, our subtitlers are assigned sub-specialisms. In summary, working within any given industry or discipline, ensures the highest levels of accuracy and consistency in the writing and subtitling process. The academic world is constantly changing. Because we understand time is of the essence, we are proud to offer subtitling services with turnaround times as low as six hours (depending upon capacity). Those are the basics on Capital Captions Subtitling Services for E-Learning. So if you have a project you need subtitled, maybe check out our online subtitling or transcription services pages for more information, or alternatively, get your e-learning subtitling quote today.